HMY Victoria and Albert performing royal duties in the early 1930's during a Review of the British Fleet. 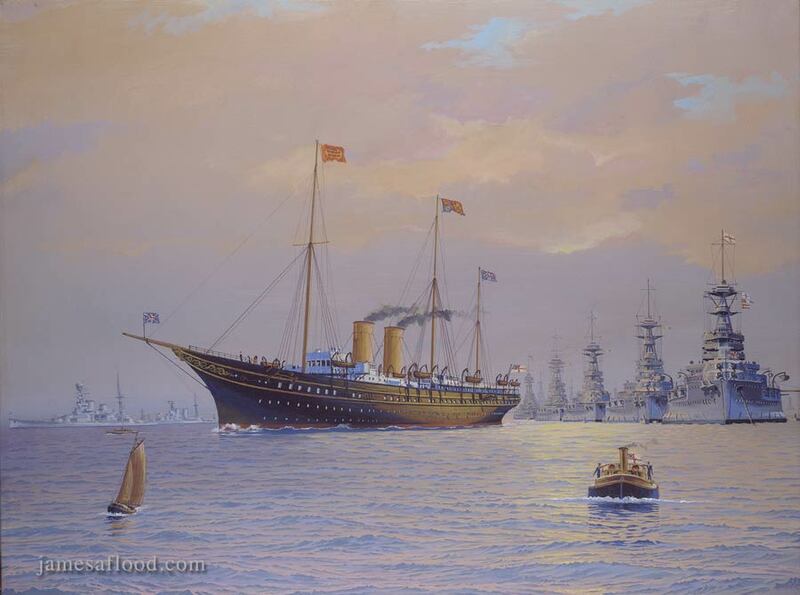 Built in 1899, royal yacht HMY Victoria and Albert was not commissioned, however, until the year of Queen Victoria's death, becoming the official royal yacht of King Edward VII. The splendor of her elegant lines and opulent furnishings provided a regal presence to many royal occasions and regattas across Europe. As the largest and most magnificent royal yacht in Europe, Victoria and Albert III served three monarchs, carrying King George V and Queen Mary at the Jubilee Review of 1935, then, in 1937, King George VI and Queen Elizabeth at the Coronation Review. In 1939, in her senior years, she went into reserve upon the outbreak of war, and was ultimately replaced years later by the royal yacht Britannia. She is depicted in this painting performing her royal duties in the early 1930's during a review of the British Fleet in the Solent. On her port quarter are Queen Elizabeth class battleships, and on her starboard are anchored the battle cruisers HMS Repulse and HMS Hood.